The heart of World Showcase and home to one of the most incredible Audio Animatronic shows in Disney History. The 26 minute presentation "The American Adventure" captures the soul of this great land and brings it to life with stirring performances by Mark Twain and Benjamin Franklin. INTERCOT Fun Fact: The sets, weighing tons each, are on a track and elevator system below the theater. Located across the way from the main building pictured above is the America Gardens Theatre, an open air venue featuring live performances.The theater is home to the Voices of Liberty, an acapella group that performs modern versions of American classics. In addition, a new group, American Music Machine, will take the stage to showcase a vibrant collection of contemporary and classic American Pop hits. 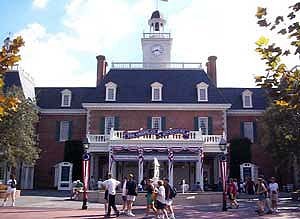 The American Adventure features a food court with standard fast food fare, as well as vendors outside selling classic American treats such as funnel cake, turkey legs, and popcorn. Block & Hans features American Craft Beer and soft pretzels. Click below for menus!